One of the primary features of a trolley oven offered by Meta Therm Furnace Pvt. Ltd is its versatility. It combines the conventional oven with the trolley loading system, and it significantly enhances the usability of the product. Several organizations and facilities across the country use our trolley ovens for their reliability, tensile strength and workability. 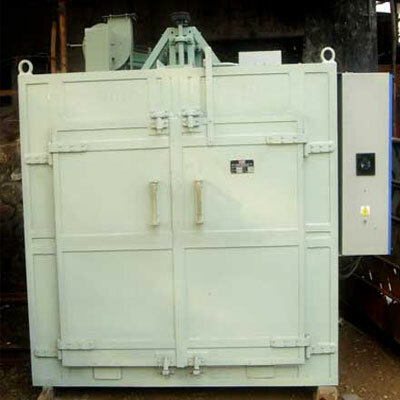 We are considered one of the most reputed Trolley Oven Manufacturers In Mumbai, and the excellence of our years of experience is perfectly reflected in the products we manufacture. Designed for industrial usage, our Trolley Rotary Rack Oven is appreciated for its exceptional performance at all times. What Makes Our Industrial Trolley Ovens Different? Ergonomically Designed - This trolley oven is designed ergonomically to ensure ease of operations in every facility. Thermal Efficiency - The thermal efficiency of this oven is unmatched in the market, and it allows you to work with greater speed. Safety Features - These ovens also come loaded with safety features to make sure nobody gets hurt while using them. Our company is one of the leading Multi Trolley Oven Exporters and Suppliers in India. Give us a call right now to place your order or just request a call back by sharing your contact details through the form.